Ten years ago today, I stepped into the world of Apple retail. Company CEO Steve Jobs hosted a group of journalists to see the first Apple Store, which opened at Tysons Corner Center in McLean, Va., on May 19, 2001. It was a strange gathering if for no other reason than timing. Recession gripped the country, Apple had reported several consecutive quarterly losses and Gateway was in process of shuttering 40 stores (and would eventually close them all). Apple Store didn't fit. 1. Exposing more people to the Apple brand and products. 3. Providing a place where Apple could showcase the benefits of the Mac lifestyle. 4. Through the Genius Bar, giving customers a place to come to for technical assistance. 5. Honing Apple manufacturing and distribution, which would later benefit products like iPod and iPad. Journalists met Jobs and his PR entourage in a hotel across the street attached to Tysons Galleria, also known as Tysons II, on May 15, 2001. Tysons Corner is an uptown mall located in one of the country's wealthiest counties as measured in per capita income. Galleria stores are the Fifth Avenue of McLean, Va. -- they're upscale in a whole other class. I was surprised at the time that Apple didn't locate in the posher mall, which seemed to click more with the Mac demographic. But Tysons I had more foot traffic. When Apple Store opened, Tysons Corner Center averaged about 57,000 customers a day -- or more than 21 million shoppers a year. Apple Store's look was unique and quite distinctive in 2001, particularly for a shop selling computers. Here's how I described it 10 years ago today: "The store sports hardwood floors, high ceilings, bright lights and clean lines -- similar to the look of the trendy clothing retailer Gap. The similarity is not surprising, considering Mickey Drexler, CEO of the Gap, is a member of Apple's board." San Francisco-based Fisher Development, which also constructed Gap stores, built the first Apple retail shops. "Contributing to the clean look of the store is the lack of network cables connecting computers to the Internet, as Apple has incorporated AirPort wireless networking to link Macs and other products to the Net." The high ceilings and wide space -- 4,500 square feet -- made Apple Store feel more open and less cluttered than other computer stores of its day and many even now. The store's design is consistent with Apple's generally understated approach to design. Apple retail stores are remarkably understated, as much now as 10 years ago. The only bright colors are found on marketing materials placed throughout the store. Otherwise, the tasteful stores are quite stark, so that the shoppers' eyes are drawn either to the colorful marketing posters and signs or to the products on sale. Low tables draw shoppers' eyes down to the products. Goods placed at eye level actually create distraction -- there is too much else to see. Apple used the low-table concept well at the Tysons store and improved it in following redesigns. 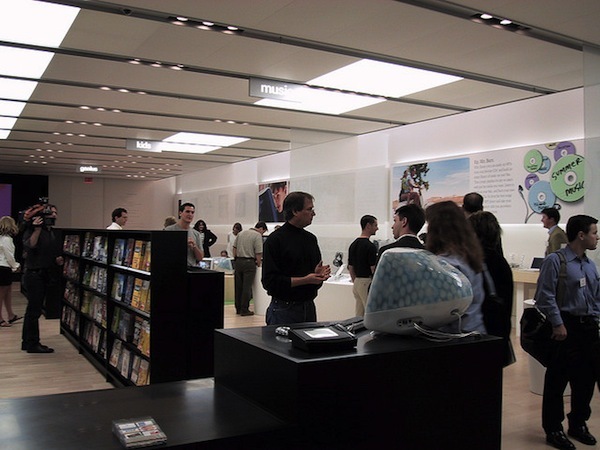 The first Apple retail shops were divided into quarters, a distinctive organization lost today because of the success, and shelf space needed for, non-computing products -- iPod, iPhone and iPad. Apple sold Macs in May 2001 and some third-party hardware, software and peripherals. The first quarter, Home and Pro, featured Macs for business -- Power Mac, Power Mac G4 Cube and PowerBook G4 -- and iBook and iMac for home. Music, Kids, Movie and Photos made up the next two quarters, what Apple called Solutions, where the tots could play games on iMacs, shoppers could use digicams to take photos and make movies or people could create music CDs. "You can make a movie in the movie section," Jobs said that day, or "burn a CD right in the store" to take home. Such activity was simply unheard of anywhere in computing retail at the time -- make it, burn it and take it to go. Related, Jobs said that shoppers would be encouraged to take time using Macs to do these activities. About 18 months earlier, Apple's CEO started pitching Macintosh as a "digital hub" for creating content. Letting people play in the stores helped introduce Windows users to the Mac lifestyle. Of course, Apple stores are so busy today, it's difficult to play this way. Down the store's middle was Software Alley, where Apple also displayed six models each of digital cameras, digital camcorders, MP3 players and PDAs. Anyone remember Palm handhelds or Rio music players? Apple once sold them. Software Alley is long a relic of the past. Apple has relegated software to the side walls, and the recent launch of the Mac App Store inside Snow Leopard raises questions about how long Apple will continue selling software in its shops. The final quarter, at the back of the store, was strangely themed Etc. This is where Apple placed larger peripherals, such as printers and scanners, a huge gallery with 10-foot video screen (for software and video demonstrations) and the Genius bar. Gone today, or I think it is: The red phone -- or "hotline." Jobs said that if the Genius couldn't answer the technical question, he or she could phone for help. It was a cute marketing gimmick supplanted by Web search. Ten years ago, people walked up to the Genius bar, sat on a stool and asked for help. Today, they must make an appointment first. The first Apple Store opened four days later, on a Saturday morning, to a crowd of about 500 people. While simply enormous at the time, the opening line seems puny compared to recent iPad and iPhone launches. How much has changed in 10 years? Apple operates more than 300 retail stores today. During fiscal 2011 second quater, ended March 28, retail revenue rose 95 percent year over year, with Apple stores selling 797,000 Macs, compared to 600,000 a year earlier, up 32 percent. Average revenue per store was $9.9 million up from $5.9 million a year earlier, or 67 percent increase. Apple retail stores had 71.1 million visitors during the quarter, up 51 percent from 47 million visitors a year earlier. The stores had their 1 billionth retail store customer last month. Apple plans to open 40 new stores during fiscal 2011, the majority internationally. By the way, I took these photos with the Canon PowerShot S20, which I had purchased for about $1,000 a few weeks earlier. The S20 was the first commercially available 3-megapixel compact. Digital cameras have changed much in 10 years, too. But that's another story. For now, if you haven't seen it, please read my first impressions review of the exciting Fujifilm FinePix X100. So, have you shopped Apple Store? Could you share your experience? Please respond in comments.